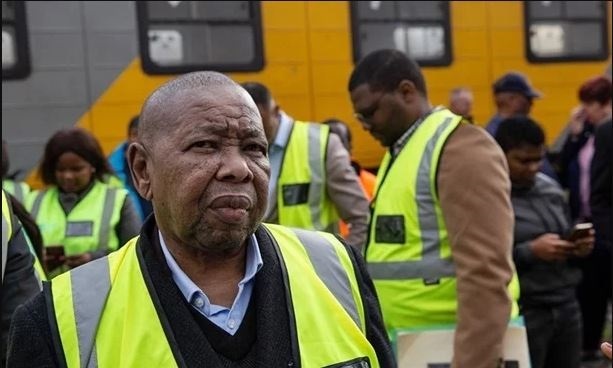 Commuters were surprised to see Transport Minister Blade Nzimande joining them on a packed 6am Mamelodi train on Friday morning, and they didn’t hold back. They told him stories of how they were tired of having to use overcrowded, late Metrorail trains. One man said that he was on his last written warning at work because when trains were late, he was late. The minister ditched the comfort of his car to catch the train, which took two hours to get him from Mamelodi to Pretoria CBD’s Bosman train station, a trip that Google estimates should take 36 minutes by car. Nzimande was met by a train packed to the rafters, with no glass to seal off the windows and frustrated commuters, who took the opportunity to vent their anger over the rail infrastructure. The delays in the services have at times led to commuters torching trains, as some passengers lose their jobs due to arriving late at work. One commuter SAnews spoke to said he was sitting on his last warning letter for late arrival at work. “The station is always like this … evenings are even worse. The trains are always late because they break down now and again. We are only told the reason is that the trains are more than 30 years old, hence the breakdowns or its due to cable theft. “The other challenge is safety because of the overcrowding. It is very difficult to be a train commuter but I only use it because it is cheap,” said the commuter, who spoke on condition of anonymity. Other commuters cornered the minister to address challenges with the Passenger Rail Agency of South Africa (Prasa). “We are losing our jobs because of Prasa,” shouted some commuters as the minister arrived at Bosman station shortly after 8am. Nzimande said his train ride experience was an important one, because he was able to see first-hand the challenges the commuters face on a daily basis. “It was important to interact with commuters because they are raising very important issues. Our trains are still running very late, some have lost jobs as a result of the train delays, and there are very uncomfortable levels of congestion … We still need more trains, but infrastructure remains a big challenge,” Nzimande said. Vandalism remains a problem. In 2017, Metrorail indicated that it had seen losses amounting to R51.4 million from 1 April 2015 to 30 September 2017 as a result of cable theft and vandalism. The theft and vandalism of Metrorail assets is also undermining Prasa’s R172 billion modernisation programme aimed at upgrading infrastructure and improving passenger rail services. However, Prasa has managed to make some strides with the introduction of the X’Trapolis Mega blue trains, which have been deployed in the corridor between Pienaarspoort and Koedoespoort in Pretoria. The trains, which are part of the modernisation programme, boast an air-conditioning system, state-of-the-art passenger safety and comfort, and universal access for all passengers to cater for those using wheelchairs. Nzimande, who rode on an X’Trapolis train, said he was pleased that their introduction was a step in the right direction. Compared to other modes of transport, trains are still the safest and cheapest way to get around. This is despite last night’s train accident. Metrorail train 0659 travelling from Johannesburg Park Station to Pretoria collided from the rear with train 0663, which was faulty and stationary at Van Riebeeckpark Station just before 6pm. More than 320 commuters were injured and no fatalities were reported. According to Prasa, 32 of the 320 injured commuters suffered serious but not critical injuries. The injured commuters were taken for medical attention at various hospitals including Tembisa, Kalafong, Zamokuhle, Arwyp, Tambo Memorial, Linksfield, Bertha Gxowa and Milpark hospitals. Nzimande told SAnews that he was shocked by the accident. “A number of these accidents have to do with the state of our infrastructure. It’s a call to us to do all we can to minimise such accidents,” the minister said, adding that he would be visiting some of the injured passengers in hospital. A board of inquiry will be instituted to determine the cause of the accident. Transport Month is being held under the theme “Together we move South Africa Forward”. The month-long campaign will roll out and showcase transport infrastructure development and services, as well as flagship projects delivered across all modes of transport including public transport and road safety. Nzimande said while it should be acknowledged that South Africa had a good public transport system, there was still a long road ahead in terms of proper integration. He urged South Africans to protect public transport facilities and infrastructure.